India have been in good form lately. The team is in ‘seventh’ heaven after winning their seventh consecutive game and the Blue Tigers will look to continue the momentum in the AFC Asian Cup qualifier against Kyrgyzstan at Kanteerava Stadium in Bengaluru on Tuesday. Kyrgyzstan, on the other hand, have drawn two and won two of their last five games, losing just one against the Philippines. Both India and Kyrgyzstan are at the top of the table in Group A in the qualification for the 2019 AFC Asian Cup. The Blue Tigers had defeated Myanmar on 28th March, via a solitary goal from talismanic captain Sunil Chhetri, who’ll be making a comeback from injury for the national team after being rested in the friendly against Nepal. The Central Asians meanwhile, had defeated Macau on the same date, via a solitary goal from defender A. Baymatov. 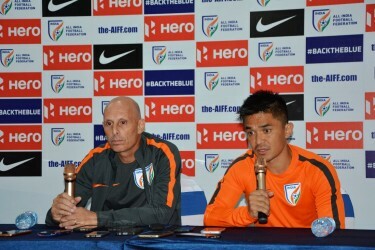 This game will be key for India as Stephen Constantine’s men will be facing their most difficult opponents since scaling the 100th mark on the FIFA rankings. Kyrgyzstan, ranked 132, are known in the Asian circuit for their powerful backline and are not serial goalscorers. In fact, the team have scored and conceded just two goals in their last five encounters, which means that it will be a very difficult job for Jeje Lalpekhlua and Robin Singh to breach the White Falcons’ defensive structure. The last game played at Bengaluru was a World Cup qualifier played between India and Guam on 12th November 2015, a game which the home side won 1-0. Robin Singh had scored a thunderous stunner cutting in from the right. The former Bengaluru FC striker will be expected to create a similar moment of magic against Kyrgyzstan. There are no real injury concerns in the Indian camp and the return of leading scorer Chhetri adds an extra dimension to the side which played a dominant second half against Nepal on 7th June at Andheri Sports Complex. Every first team member seems to be fit. Lanky defensive midfielder Rowlin Borges had a head injury in the last game and was replaced by Eugeneson Lyngdoh in the 28th minute, but looks certain to make a comeback into the starting XI. In a massive respite for the Indians, Kyrgyz captain and key defender Amazat Baymatov is set to miss the game with an injury. The defender has had a non-stop season ever since last July and has finally given in to the rigours of the game. The 29-year old, who plays for Riffa in the Bahrain League, is a strong figure on the pitch for the Falcons and his absence will give Jeje and Robin a little more breathing space in the attacking third. Both sides have met each other thrice and no game resulted in a draw. The Blue Tigers have won the duel on two occasions, succumbing to defeat in the most recent encounter in 2010 in AFC Challenge Cup. Kyrgyzstan first played India in the Nehru Cup 2007, where the home team won the plaudits 3-0. The second encounter again took place in the Nehru Cup 2009, with Chhetri and Bhaichung Bhutia hunting as a pair to give the hosts a 2-0 win. The last game, though, ended 2-1 to the Falcons in the AFC Challenge Cup. India will be expected to play for a 1-0 victory, clearly understandable by the defensive prowess of the visitors. The team will line up in a 4-1-3-2, with the goalkeeper, defensive line and Rowlin Borges holding onto their places. Chhetri and Lyngdoh will be starting in the attacking midfield roles, the captain on the left and his understudy in the centre. After a positive display, Holicharan Narzary might give Jackichand Singh a run for his money on the right wing, while the No. 10 is expected to start on the right on account of his high work rate. 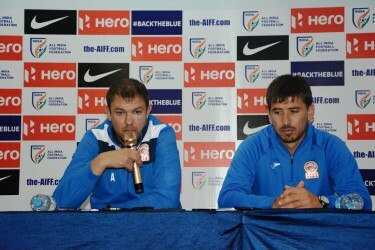 Singh and Lalpekhlua are set to join hands again upfront and Constantine will hope the powerful No. 9 forgets his dismal performance against Nepal and comes into his own soon. Lalpekhlua will be expected to operate in a deeper role. The pair of Chhetri and Lyngdoh will be expected to give the Blue Tigers their creative edge in the attacking third and the result could well be marked by how well the Bengaluru FC duo operates in tandem. The Kyrgyz Republic team is expected to line up in a 4-4-1-1 system, easily gauged by their defensive stability under Aleksandr Krestenin. Mirlan Murzaev will play the No. 10 role, just behind Vitaly Lux, a powerful No. 9. In the middle of the pitch, Edgar Bernhardt will be expected to start on the right and 30-year old Pavel Sidorenko on the left, players who add a creative spark to the composed Falcons. Ahlidin Israilov and Shamsheiv Islam will complete the four in midfield, adding the much-needed stability and youthful energy. "I think the ranking comes for a particular reason. But, on the given day, you have to perform on the field. 32 above or below in the FIFA Ranking doesn't decide the result of a football match. Your hard work counts on the pitch. It’ll be a battle of stamina tomorrow. We are very physical and we think we're strong enough to take them on. We’re hard working team. They are a difficult side to break down." Alexsandr Krestinin: "Our main goal is to qualify in first place. We are the favourites in the group. Of course the last match was tough for us,” he said before adding, “We will aim for a victory tomorrow. We are ready and we know what we need to do tomorrow. I think they also have information about us. This is the 21st century and there are no secrets. It's true that we didn't play many matches recently. But my boys play in Europe and all are in good condition. We just need to execute our plans on the pitch to get the result. We don’t need to make some big preparation for this game. "Of course, we know India is a strong side with good physical conditions and good in defence,” before adding, “They are very strong at home. We will not be satisfied with a draw. We came here only for a victory." Sunil Chhetri-India: When this man is playing, there’s hope for the Indian fans. The Blue Tigers might have won the game against Nepal 2-0 without him, but Chhetri is a talisman who leads by example and is arguably the creator-in-chief for the national team. The 5.6 feet forward will flank the left wing and is expected to breach a defence which has just conceded once in their last 500 minutes on the pitch. Chhetri’s return from a muscle injury will add bite to an attack which looked a little out of depth against Nepal and scored twice with moments of brilliance from Lalpekhlua. Mirlan Murzaev-Kyrgyzstan: The 27-year old has led the line for the Falcons for eight years now and his ability to hold up play and run down the channels makes his a threat to the opposition and a delight to audiences. Murzaev plays as a forward for Turkish club Usakspor in the Amateur League and his five goals in 30-odd appearances for the national team holds him in good stead. Murzaev’s duel with Sandesh Jhingan will be a treat to watch, as the 6 feet tall forward will look to outfox the powerful Indian defender. Murzaev is also adept at functioning on the wings and has the speed and vision to trouble the full-back pair of Pritam Kotal and Narayan Das. The second qualifier for the AFC Asian Cup 2019 will be broadcast live on the Star Sports Network and Hotstar from 8 PM IST on Tuesday. You can also follow the Live interactive commentary on Khel Now. 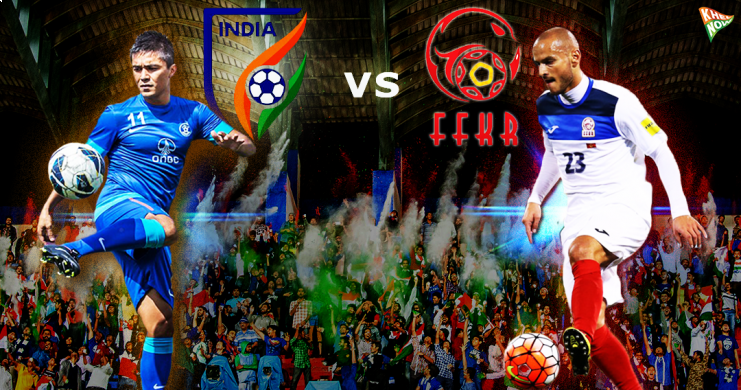 Read: West Block Blues and Yellow Brigade are extensively supporting the National Team. Read how!